In the center of New York City, the Graduate Center, CUNY's M.A. program in Liberal Studies is a celebrated institution of progressive thought, critical discourse, and the pursuit of interdisciplinary inquiry. The program encourages cross-pollinated learning between the Humanities, Sciences, and Social Sciences while preparing students to tackle the world—and their careers—in an intersectional and deeply curious way. 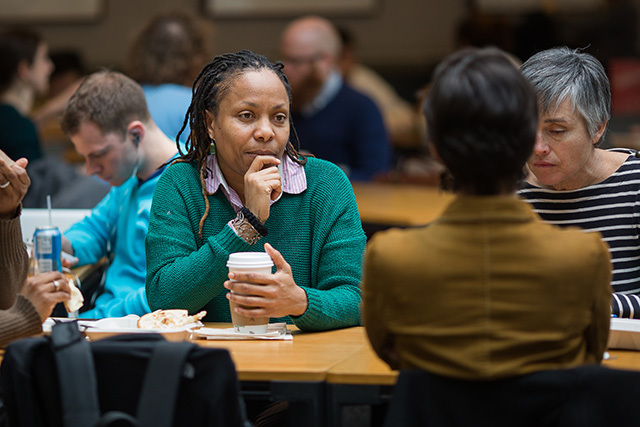 Students choose the Liberal Studies program for a multitude of reasons: its esteemed scholars, course offerings in the university's PhD programs, the distinguished research produced within the program, and of course, location, location, location. And because learning about learning is a worthy pursuit, Gothamist chatted with a few alumni and a current professor to get the inside scoop on the program—and how an M.A. in Liberal Studies ignites the life of the mind in the heart of the city. Alexia had received her communications B.A. in Mexico—but with the country's increasing instability and the daily threat of violence, she set her sights on getting out. Her goal was to study the social sciences or the arts in New York City, and the Graduate Center, CUNY was a natural fit. "I wanted to be in a place that would value cultural diversity and intellectual curiosity," she said. "And that's exactly how I felt when meeting the program's staff for the first time." Photo courtesy Da Ping Luo. James had studied English as an undergraduate, but admitted he didn't quite know what he wanted to do for a living. 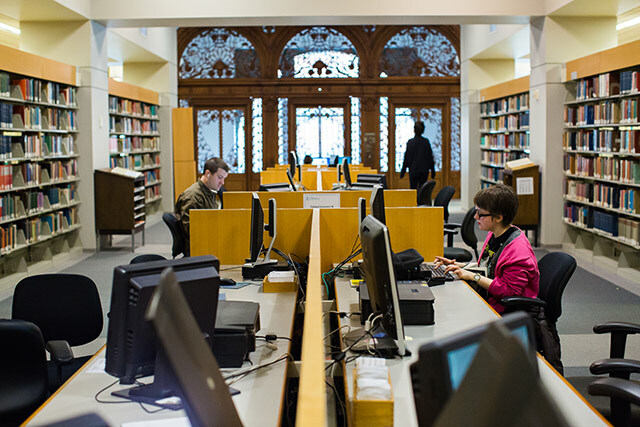 The Graduate Center, CUNY provided him with guidance right from the start, suggesting a Liberal Studies track in Digital Humanities, which, like many, James had never heard of. "It's the use of technology to examine the humanities in ways previously impossible," James explained. "When I applied to The Graduate Center English program, the assistant director of admissions suggested I look into Digital Humanities, based on my interests. I didn't fully know what to expect—but the program seemed more flexible than an English degree. It sounded marketable!" The Graduate Center, CUNY made sense for both Alexia and James, since the Liberal Studies program promised academic flexibility and the opportunity to guide their own courses of study in two very different, yet equally rewarding, directions. Alexia enrolled in the Latin American, Caribbean, and Latino Studies track where she worked to better understand underserved immigrant groups. There, she was guided by expert scholars with long records in migration studies. "During my third semester, I took a course titled 'Latinos in the US,'" Alexia said. "The materials we discussed in class introduced me to a whole new dimension of the Latino identity—both contextualized and in its own terms—that was completely unknown to me. The professor became my advisor, and encouraged me to register in courses cross-listed with the sociology department. When it was suggested that I look at Professor Mehdi Bozorgmehr's course on International Migration, I knew it would help to expand my understanding of migration patterns and communities." Alexia now works as an advocate for digital equity in Latino communities at Sesame Street's Joan Ganz Cooney Center. Asked how the Liberal Studies program prepared her for the working world, she said, "the field I work on relies heavily on cross-disciplinary collaborations. Learning how to listen, negotiate, and build from others' perspectives has been one of the most useful skills in my professional development." Outside of the classroom and beyond the professional world, Alexia was confident in the leadership tools she honed during her time in the Liberal Studies program. "My education also prepared me for advocacy work," she added. "I shared class with many political and human rights leaders: people who took their academic learning into real life by fighting for the underserved." For James, it was all about discovering a passion in emerging technology—one that opened the door to limitless practical applications. 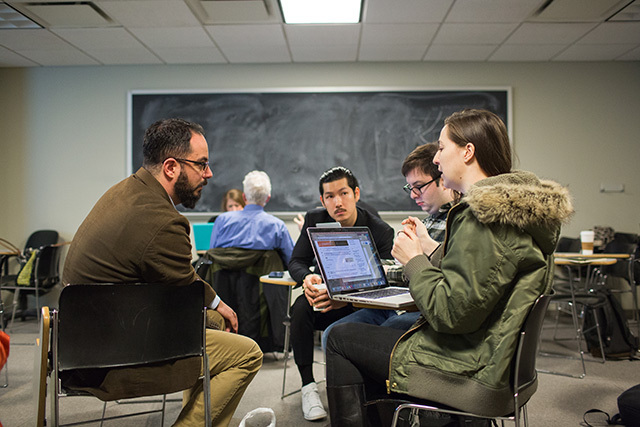 "Maybe it's the newness or maybe it's the philosophy behind it, but Digital Humanities is a degree that allows you to bring your interests with you," he said. "The digital space affects every part of our lives. If you are interested in politics, there is polling data to be examined. If you're interested in video games critically, academically, or narratively, that's Digital Humanities. What you put into the program, in terms of curiosity, is exactly what you will get out of it." Speaking to his future in the working world, James sung the praises of cross-disciplinary study. "There is a need for people who can explain how the tech works and why it matters to people who do not speak the tech language," he added. Echoing this sentiment, Dr. Elizabeth Macauley-Lewis, an assistant professor in the Liberal Studies program, believes her students are uniquely positioned to succeed—both in the classroom and in the working world. "What I see in our students is curiosity. Because the program is so flexible and interdisciplinary, the students are willing to take a risk and try something new. That openness, which we encourage in the Liberal Studies program, means that students are interested in learning about new fields and subjects," she said. "It is this ability to select electives across disciplines that makes our students independent thinkers who are well-prepared for a range of careers—from academia to industry." Commenting on their location within New York City's bustling metropolis, Professor Macaulay-Lewis is keen to leverage the abundant resources the urban environment has to offer. "Faculty use New York City as a classroom—I take my students on walking tours all over," she said. "We are also working to forge bonds with New York City's institutions through an internship course that we are developing." Professor Macaulay-Lewis concluded by telling us how she is constantly inspired by her students who work jobs, balance family life, and make time for volunteer opportunities during their rigorous courses of study. After all, the program is highly flexible—just like any good New York City institution. Students can enroll in both full- and part-time courses of study, and may choose to take summer classes starting as of this year. 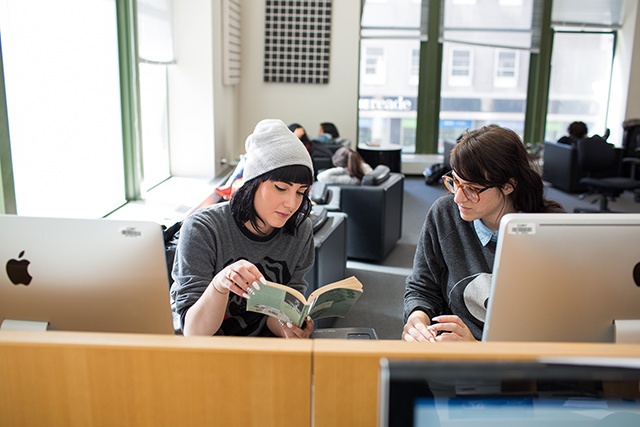 To learn more about the Graduate Center, CUNY and the M.A. in Liberal Studies program, sign up for more information. This post is a sponsored collaboration between The Graduate Center, CUNY and Gothamist staff.